In this third book in the Mah Jongg Mysteries series, Micki Demetrius takes the lead. to help her in spite of the danger. connect the dots in a nefarious web of greed, neglect, secrecy and murder. Essential oils distributor Dorcas Wiley is the boss everyone loves to hate. So when she turns up dead, killed by her own trophy, disgruntled saleswoman Cathy Broderick is the obvious suspect in her murder. 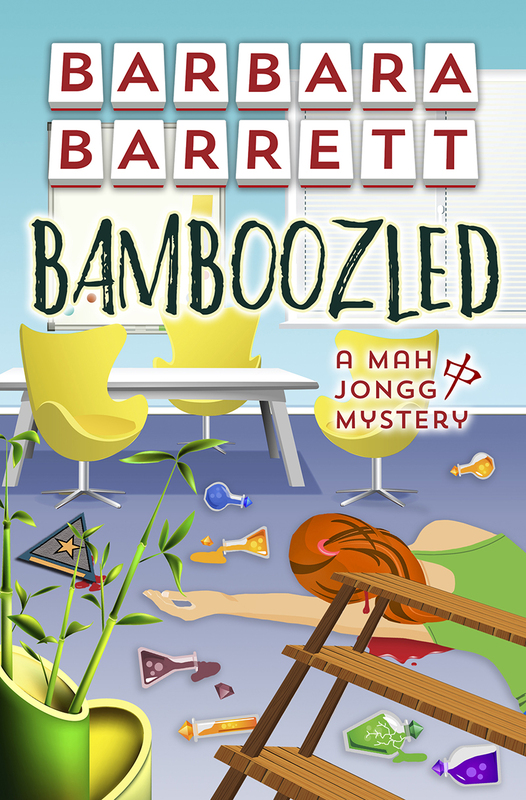 Despite opportunity, motive and incriminating evidence, Cathy declares her innocence and enlists her mah jongg pals—Sydney Bonner and her cronies Marianne, Micki and Kat—to help save her from the death penalty. Hot off a recent and nearly deadly investigation, the women are cautious about putting themselves in peril again. Syd’s spouse isn’t thrilled about another mystery in their lives, either, but he can’t resist the plea of Cathy’s husband. Soon, Syd is leading the way as they tangle with grumpy salespeople, the victim’s estranged husband and boyfriend, a mysterious housekeeper, a litigious customer, an annoyed sheriff and Cathy’s own arrogant lawyer. The women have their own issues to deal with in their central Florida town of Serendipity Springs. Kat faces a health challenge, Micki fields a mysterious inquiry from her ex, Marianne has a chaotic anniversary and Syd wrestles with her husband over who’s really in charge. But nothing puts everyday life into perspective like the moment when their investigation brings them face to face with danger. I just love a book that is full of intrigue, gossip and exciting characters. . . The characters are interesting and I absolutely loved the four women turned sleuths that take investigating seriously. Excellent characterization, an interesting background (I really want to learn to play Mah Jongg now), and subtle humor make CRAKS IN A MARRIAGE an enjoyable series debut. Things are great until one of their fellow players is accused of killing her husband so she asks them to help clear her name since they are so in tune with the gossip network around town. What follows is a comical investigation as this group tries to keep spouses ignorant while still trying to save the day. Syd and her friends are fun and funny. They are full of spirit . 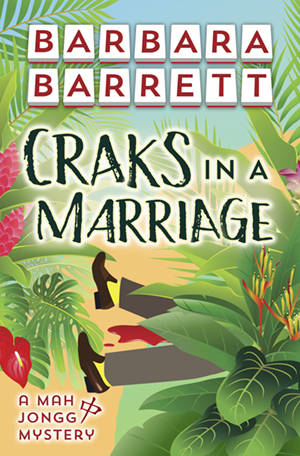 . . Craks In A Marriage was a fun fast cozy read. The characters and setting were brought to life by Ms. Barrett and made this an exciting mystery from start to finish. I am looking forward to visiting Serendipity Springs again. The characters are great, quirky and likeable. They’re well-developed and complex. I really enjoyed them. When Sydney Bonner overhears a fellow mah jongg player arguing on the phone with her husband, she realizes the couple’s “perfect marriage” isn’t all it appears to be. A few days later, the husband is found dead, his head bashed in. Fearing she’ll be considered the most likely suspect, the widow prevails upon Sydney and her three friends—Marianne, Kat and Micki—to find out who really killed him. Though none of these four fun-loving, take-charge retirees has any training as detectives, the women agree to launch a secret investigation. As they dig under the happy veneer of their community’s social life, they find more than enough suspects, from shady ladies to resentful golf buddies, to keep them looking over their shoulders. Could the murderer be lurking among the talent in a chaotic production put on by Sydney’s husband, who will do anything to keep busy in retirement? Could the sheriff, who may have more than a professional interest in chanteuse Kat, end up pinning the crime on the women instead? Each discovery during their investigations and their weekly mah jongg game keeps them running as they close in on the killer—but the killer may also be closing in on them. The Mah Jongg Mystery series features four retired amateur sleuths who live in the small Florida town of Serendipity Springs, all female and all friends who play the game of mah jongg together. Though they don’t set out to investigate murder, after their first experience in this story, others start looking to them to help investigate subsequent homicides and questionable accidents. In this first book, Sydney Bonner takes the lead, although she turns to her three friends for help. Though this series features four protagonists, the others will take the lead in subsequent stories. Two are married, one is divorced and the fourth, who has been single all her life while she tended to her ailing mother, now finds herself the object of the sheriff’s attention in this series. The four don’t seek out murder; somehow the circumstances and those affected drag them in. Meanwhile, as they attempt to gather information, life goes on in their community in such activities as a women’s club, a social group for those over 50, real estate transactions, numerous stops at the local coffeehouse, and even a shopping trip to Naples. Sydney’s husband, Trip, and her friend Marianne Putnam’s husband, Beau, are golf buddies who spend many a day on the course. 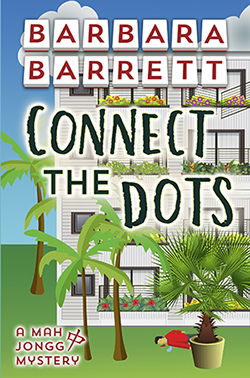 When not there, Trip is busy seeking to build a new post retirement life, and Beau is often prevailed upon to join in Trip’s latest activity, which in this first book is a town follies. Kat Faulkner has lived a frugal life until winning big in a lottery shortly after her mother’s death; suddenly, Kat has money and doesn’t know how to spend it. But her divorced friend and freelance writer, Micki Demetrius, does, even if it’s to guide Kat through a makeover and wardrobe change for her lounge act.